Are you a gardener or have been itching to start a little gardening corner at home? It may seem difficult and complicated but the truth is, it isn't. The results are really satisfying and the process therapeutic. If you do have the intention to start one, read on. 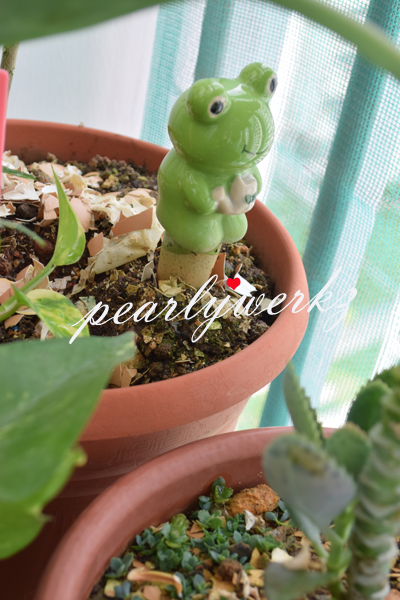 You can also find out from this post on some interesting finds from Daiso which I have gotten to spruce up my mini garden, and help me maintain them. Why not? They cost you only $2 after all. 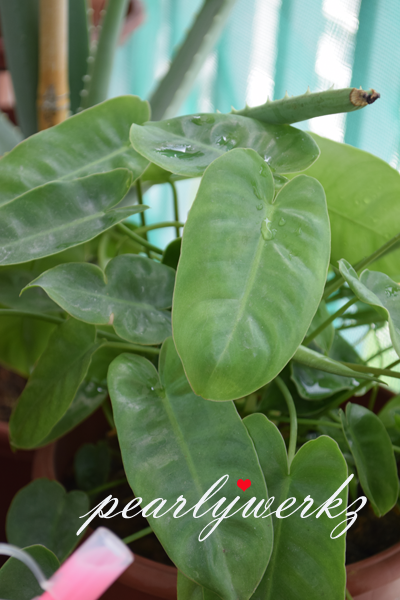 I hope that my little plant collection here will somehow inspire you to start planting some greens around your home. If not, just take some time to ogle at my pride and joy. Adult Aloe Vera plant grown from a small baby to this. When I first brought it home, they were only tiny baby plants. 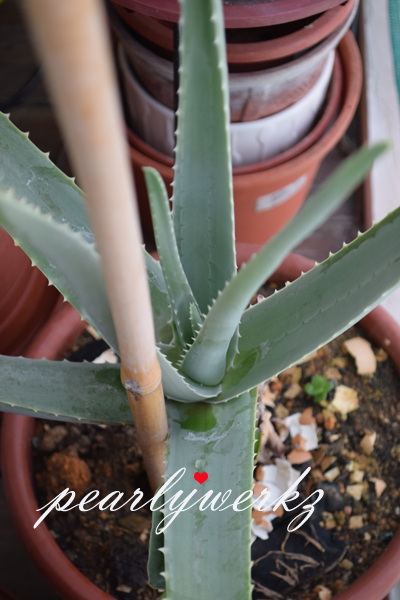 1: Daiso Product - The bamboo stick support on my Aloe Vera plant helps me keep my plant in place. They are sold in a pack of about 10 sticks. 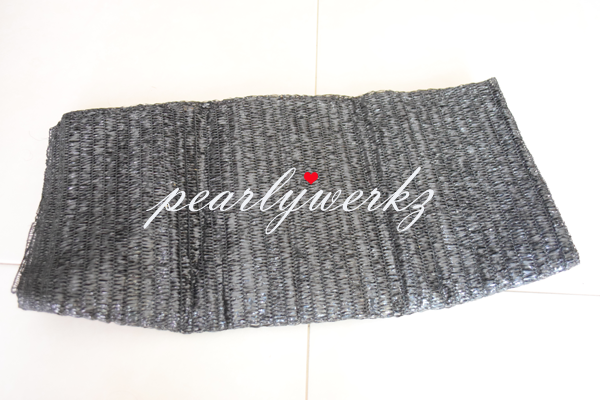 There is also the green "metal" version which is stronger and more hardy. I used them to hold my black canvas which acted as a shelter for excess sunlight on my previous batch of tomato plants. 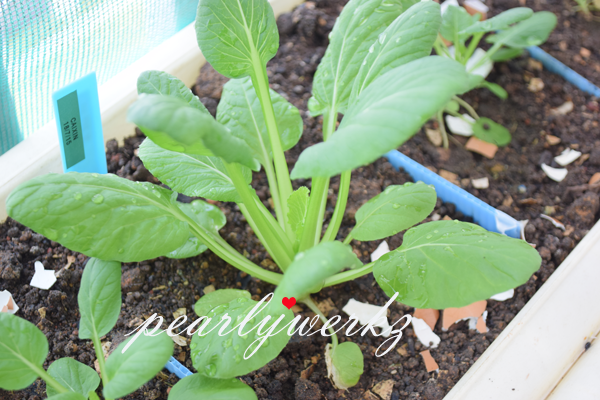 These are Caixin planted from seeds, there were originally 5-6 plants. I harvested these plants for 5-6x before they started to flower and seed. 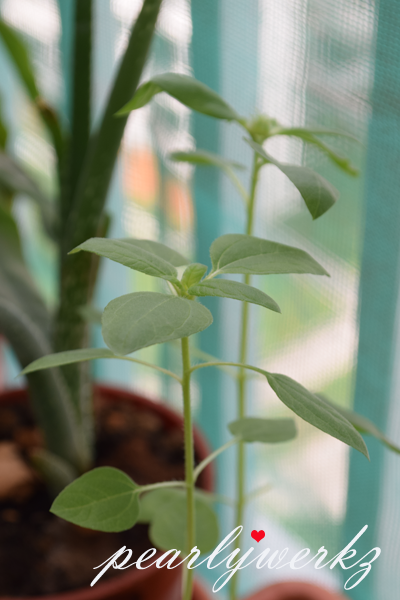 Sweet Basil are relatively easy to grow and they seed very fast. 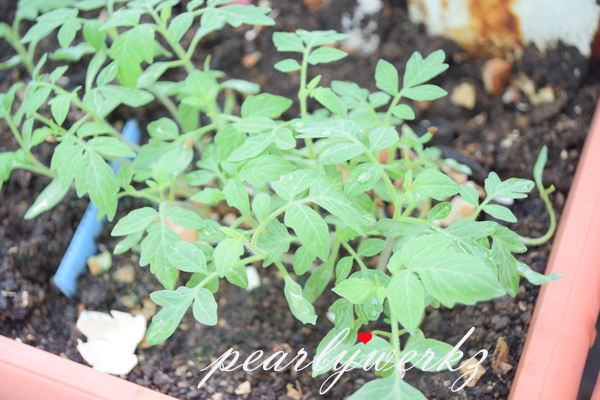 It is a good plant to start with if you are planning to grow herbs. I have tried Dill before as well, they grow wild and get relatively messy to maintain. 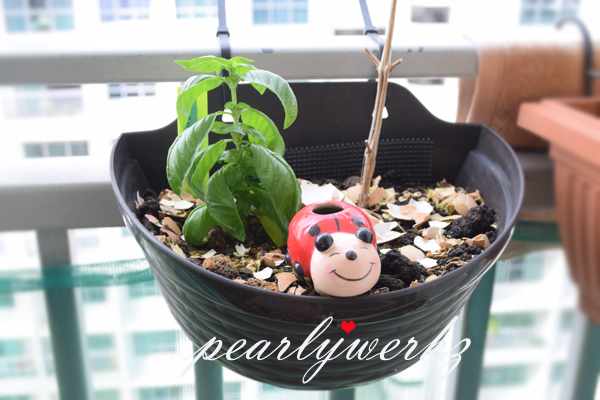 2: Daiso Product - The bumble bee ceramic self-watering figurine is very useful for growing plants that needs plenty of water. They also come in several other designs such as the frog, the lady bug and tortoise. I use them all over my garden. 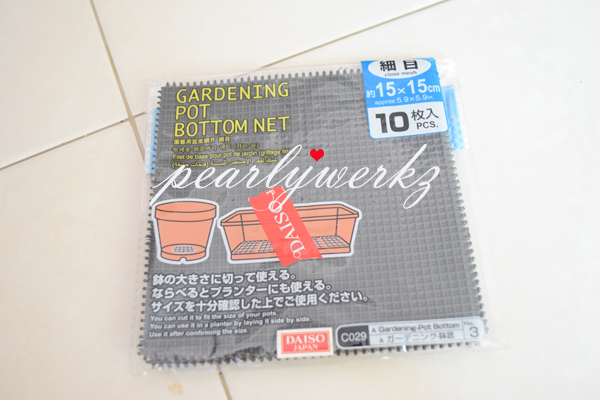 3,4,5: Daiso Product - The black hanging flower pot, black bottom net and cable ties are all Daiso. 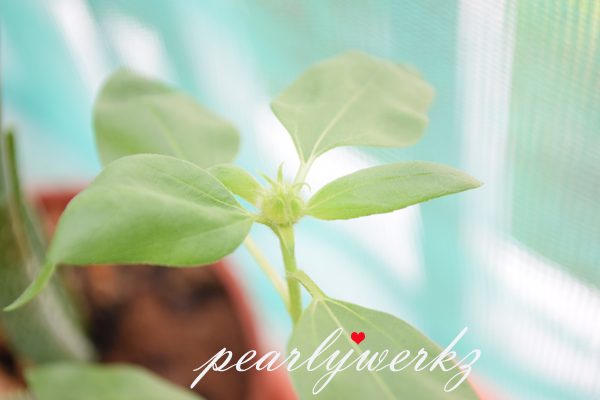 I am very serious when i come to maintaining my garden, I like to keep track of how long the seeds takes to germinate, grow from a adult plant, and eventually flower and fruit or seed. 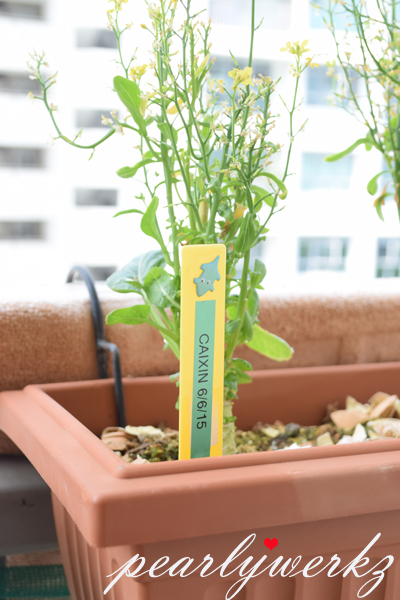 I brought these sticks which came as a pack, so I could label and track my plant's growing status. I can also label them so I know which plant is which. 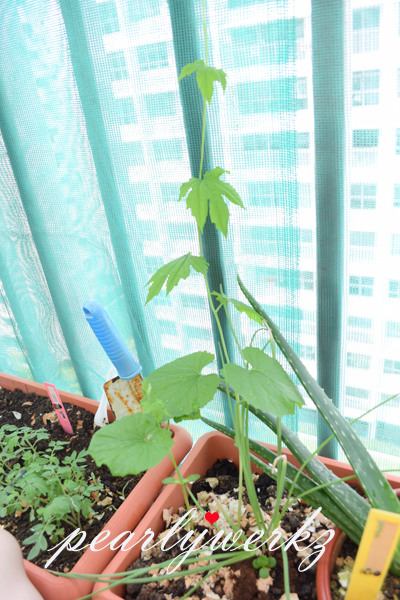 These are some bitter gourd plant growing up along with my onion plant, aloe vera and tomato. 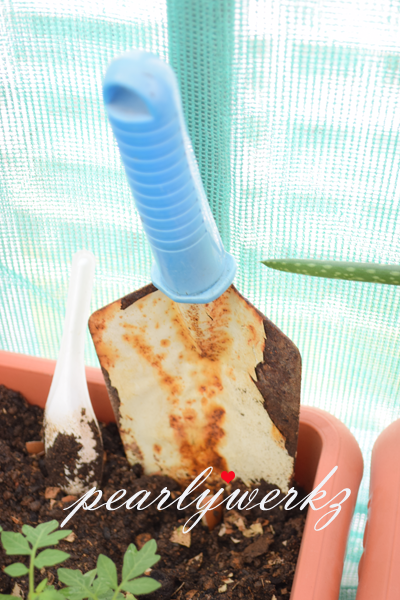 7: Daiso Product - I brought the spade to help me with the loosening of the soil. Unfortunately, it have rusted. You can see the paint peeling off. They have nicer designed ones and plastic spades as well. Do look around. 8: Daiso Product - These white long pots where my new batches of caixin and spinage is grown are very worthy investments because they cost a bomb when you get them from the florist. However, the material is quite thin and will crack if used over a prolonged period. 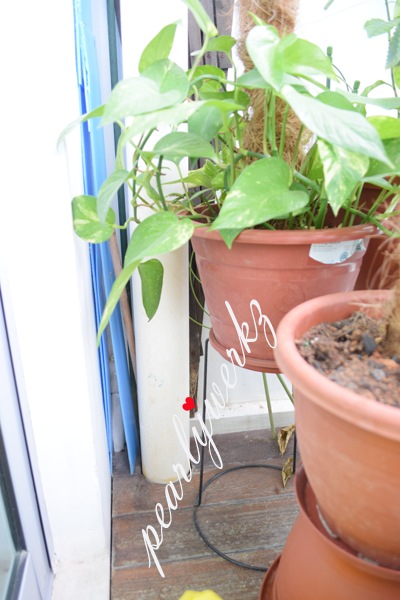 I am glad that out of my 4 pots, 3 are still surviving well. 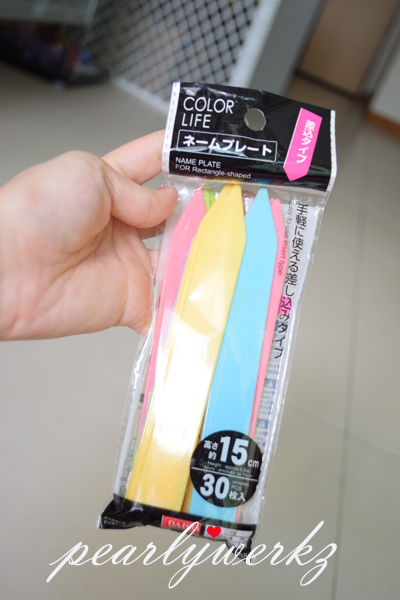 9: Daiso Product: I bought several pot stand so that my plants could get the optimal sunlight which they require. These works as space saver for me as well as I could slot younger plants at the bottom. 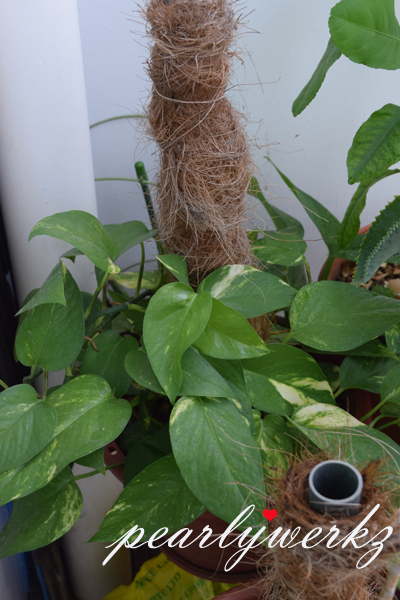 I am not too sure about the name of these plants but they thrive both in water and in soil. They are extremely hardy and looks similar to the money plant. 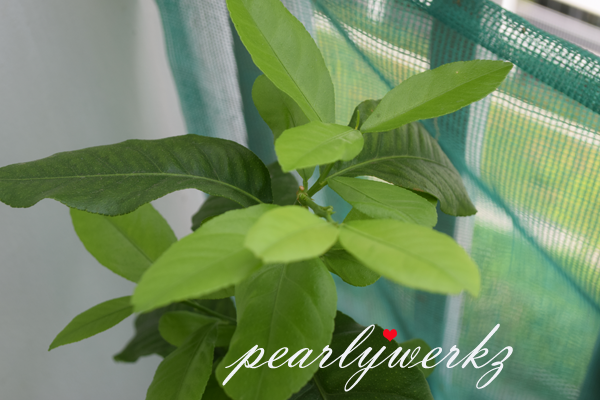 A lemon plant surviving well even after batches of butterflies come laying eggs and I get lots of caterpillars on them very frequently. I love the colour of the young leafs and the lemony scent that they give off. 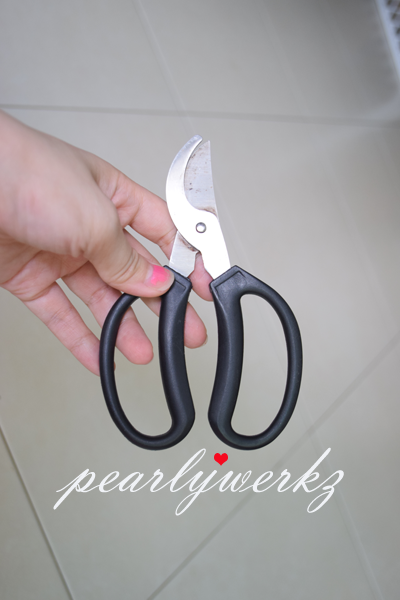 10: Daiso Product: I got myself this pair of gardening scissors as they are good for pruning leafs and chopping off thick stemmed plants. 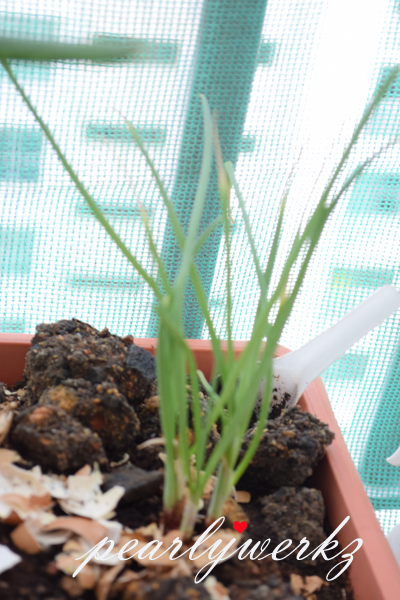 Onions are very easy to grow, you can even grow them without soil. Spring onion makes good garnishes for dishes. Its nice to have them readily available in the garden. My overcrowding baby tomato plants. This is not the correct way to do it. 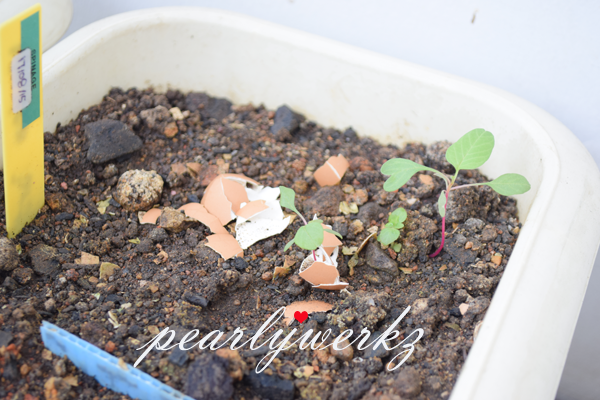 If you can, separate the seedlings so that they get optimal nutrients from the soil. 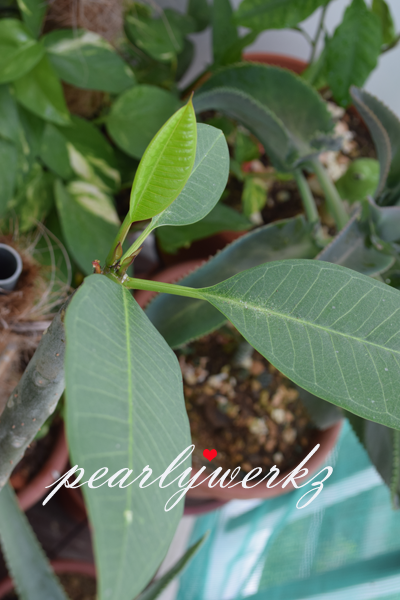 Transplanting can be dangerous as you may accidentally break the plant's roots or stem. I've tried growing sunflowers many times and failed all the time. This 2 are my latest batch and I see that 1 of them is about to flower. I am hoping to see this sunflower bloom. Let's hope it'll make it. 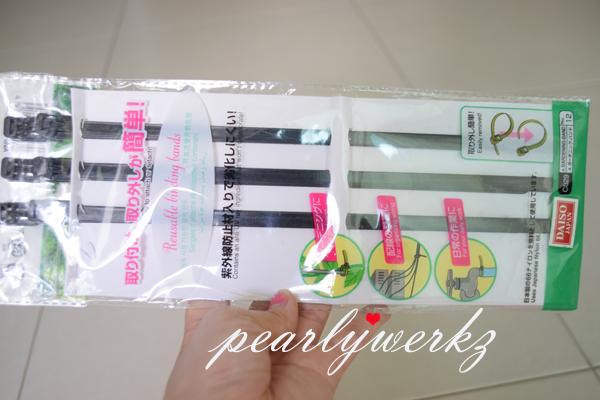 11: Daiso Product: Plant support are necessary when your plants grows taller and begins to lose its support and balance. I used these quite often to support my taller plants. 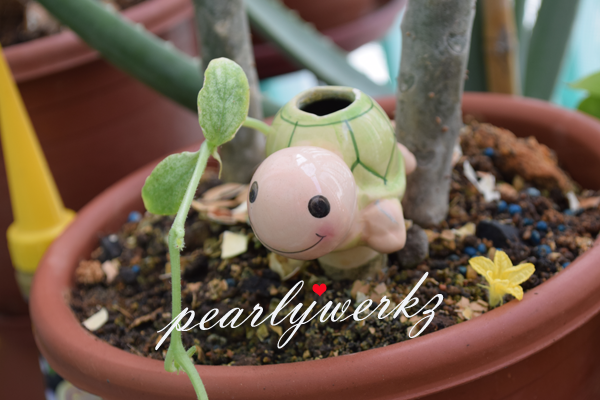 12: Daiso Product: For climbing plants like the bitter gourd and pumpkin plant, i make use of these to let them climb all over. Planted a pumpkin seed beside the Frangipani in frustration and it flowered. 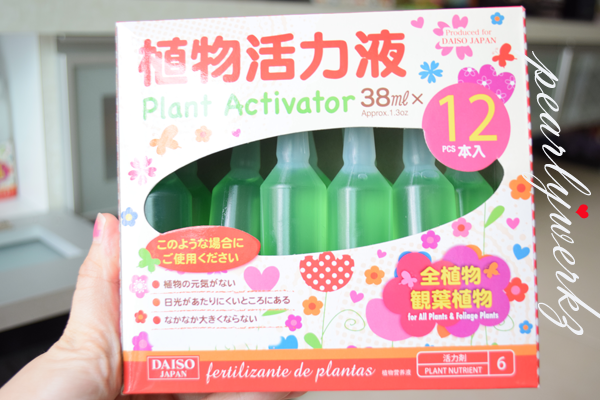 13: Daiso Product: I used these liquid plant activator fertilizers on my non-edible plants to promote flowering, there is another version for green healthy foliage. They kept my Frangipani plant healthy but did not make them flower. 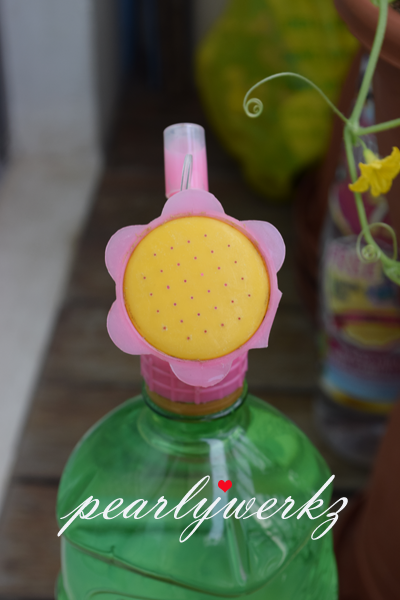 13: Daiso Product: I was fascinated by this watering head because it was double sided and can be attached to any drinking bottles. I used the other side for pouring water into the self watering animal ceramics and this shower side to water my plants. 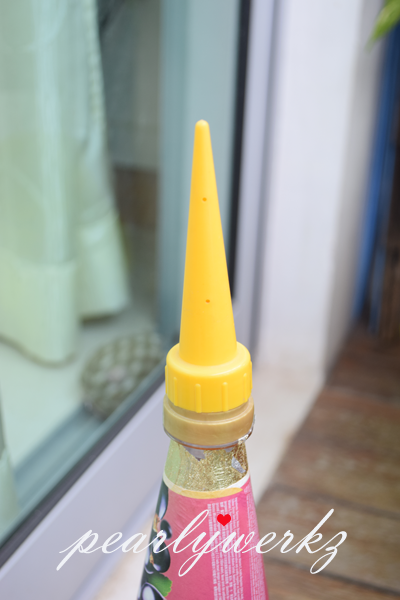 14: Daiso Product: I use this attachment head on my large bottles for self-watering when I go away for short trips previously. They can be used for normal watering of plants as well. 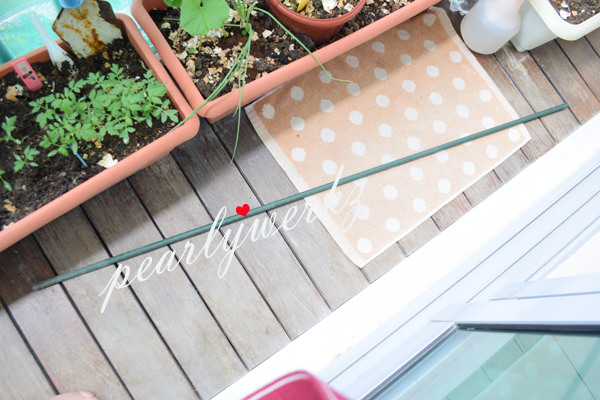 15: Daiso Product: This is the black canvas sheet i use for sheltering my plants from excess sunlight. 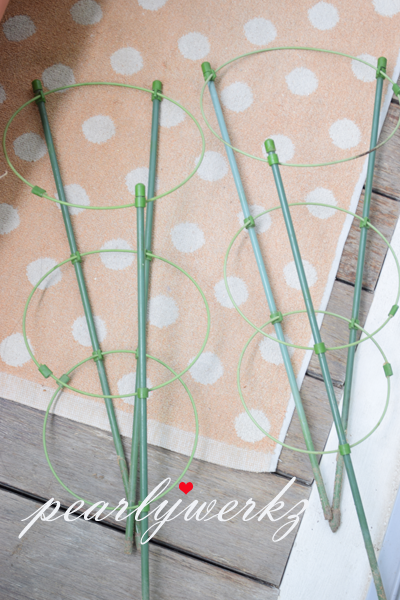 You can support them using the green poles and anchoring them directly into your plant pots. I hope that my post have somehow inspired you to start your own garden. Daiso has many gardening tools and nice flower pots. 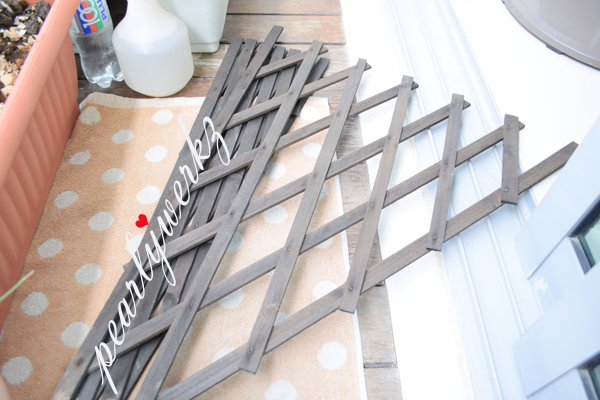 Get something simple to beautify your homes today. If all else fails, you can grab a bunch of foam or plastic flowers to beautiful your homes. Why not? They are lasting and durable. 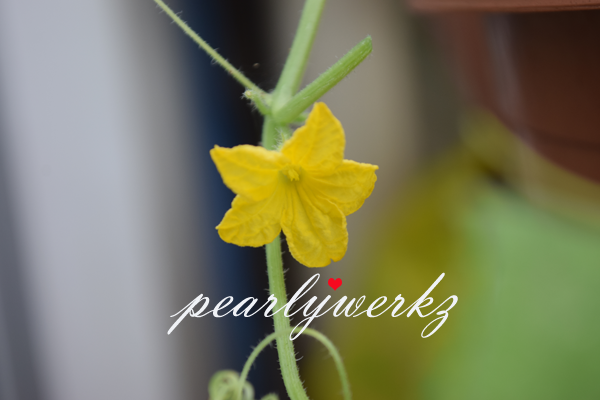 Do share with me what are your favorite finds from the gardening section. Where did you get the climber stick for your money plant? Should I not be using plant activator on edible plants such as basil? I wouldn't recommend it because the source is unknown.